Portfolio construction that combines broad diversification, continuous management and low-fees. For decades, many investors believed that selecting stocks with the highest expected return is all that mattered. What was missing was a useful way of assessing the risk characteristics of an investment, especially how it relates to the risk characteristics of other investment options. The game changed in the early 1950s when Harry Markowitz presented the idea that investors could improve portfolio performance by optimizing trade-offs between risk and return in a mixed basket of investments. Known today as Modern Portfolio Theory, the concept for which Markowitz was awarded the Nobel Prize, this investing concept dominates prudent asset allocation methods and is the guiding principle of our process. This approach, combined with our focus on minimizing fees and developing smart tax strategies, helps our clients attain the financial goals we set during retirement planning. So how do I allocate my assets? At Cannon, we believe primarily in the use of low cost, tax-efficient investments with an emphasis on index funds, which are a group of securities designed to replicate the performance of a broad market. How much do taxes affect my returns? Tax sheltered vs. taxable investing. We focus strongly on finding ways for you to maximize tax favored account funding to delay the date at which taxes are due on those earnings. Customized allocations for tax purposes. Since not all investments are taxed the same, we invest tax preferred accounts differently from taxable accounts. Our strategy is to put less tax-efficient investments in your tax-sheltered accounts. Tax strategies in legacy planning. Taxes can have a significant impact on what your heirs receive, but smart planning can limit the tax impact or in some cases ensure gains are ignored at inheritance. While the initial establishment of a portfolio that manages risk/return expectations is one thing, ensuring it stays that way is another—especially as market conditions change. As client relationships evolve, a significant function—and true value—of our investment advisors is to provide discipline and reason in all portfolio decisions, allowing you to avoid making emotional or undisciplined choices that might hinder returns or jeopardize your ability to fund long-term goals. As part of that oversight, we conduct annual reviews to ensure your portfolio remains aligned to your needs. By discussing changes in your personal situation and evaluating portfolio performance relative to established goals, we ensure your investment plan remains current and expectations are appropriate. Since inception, Cannon has been committed to keeping its transparent fee structure below industry averages. If you’re unsure how much you’re paying your current advisor, it’s time to ask. Are your investments allocated to the appropriate accounts to maximize tax efficiencies? Do you really understand the underlying costs associated with your current investments? Do you know exactly how your current advisor is compensated? 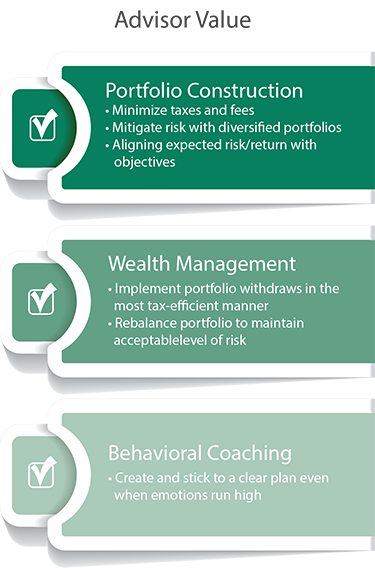 Would you prefer to work with a financial advisor under a written arrangement with predetermined expectations? Does your investment mix match your tolerance for risk? Do you understand the fiduciary obligations of a Registered Investment Advisor to place your interests first?